Type I fractures occur through the growth plate. These injuries may present with normal radiographs, and the diagnosis is often made clinically when tenderness is palpated over the growth plate. 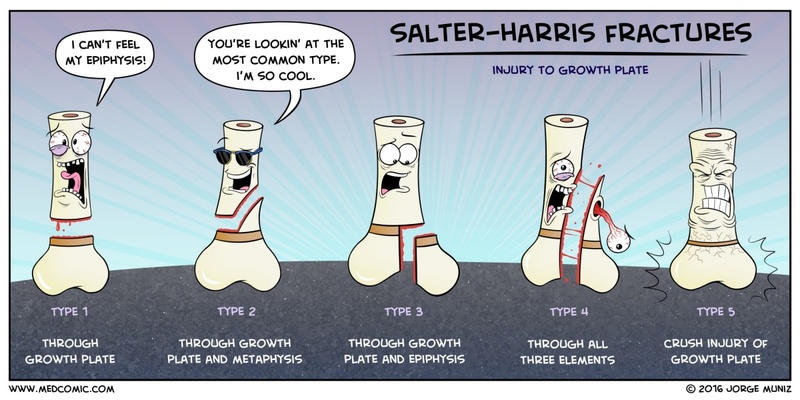 Type II fractures occur through the growth plate and metaphysis. Type II injuries are the most common physeal fractures. Type III fractures occur through the growth plate and epiphysis. Type III injuries are intra-articular, and the diagnosis is made radiographically based on the appearance of an epiphyseal fragment not associated with a metaphyseal fracture. Breastfeeding and newborn hospitalization rates: What should be done about it?